The University of New Hampshire has a long history of research in high energy astrophysics. The earliest work began in the 1950s with the studies of high energy cosmic rays using detectors placed on top of nearby Mt. Washington at the Mount Washington Observatory. Although UNH still operates cosmic ray neutron detectors both on Mt. Washington and on the Durham campus, the primary emphasis of the UNH research is in the realm of X-ray astronomy and gamma-ray astronomy. This work encompassess a wide variety of astrophysical problems, including high energy emissions from solar flares, gamma-ray bursts, active galaxies, X-ray binaries, black holes, pulsars, novae, supernovae and the cosmic diffuse background. This extends the range of UNH research topics to the very edge of the known universe using X-ray detectors and gamma-ray detectors placed on sub-orbital balloon platforms and on orbital satellites. 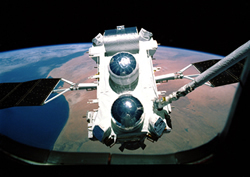 UNH investigators also act as Guest Investigators for various astrophysical facilities, both in orbit and on the ground. Astrophysics research at UNH is carried out by members of the Space Science Center, an organization which was formed in the 1960s and which is currently affiliated with both the Physics Department and with the Institute for the Study of Earth, Oceans and Space (EOS). Faculty members in the Space Science Center are generally associated with both the Physics Department and with EOS. Most of the astrophysics research at UNH is based in Morse Hall. Students, both undergraduate students as well as graduate students, are an integral part of the research activities at UNH. They have the opportunity to become involved in all aspects of the research programs. Most projects are heavily dependent on student support.